Although now formally separated by wall/fence Structure 44 and presumably invested with its own distinct function, OA46 is still believed to have an association with OA59. 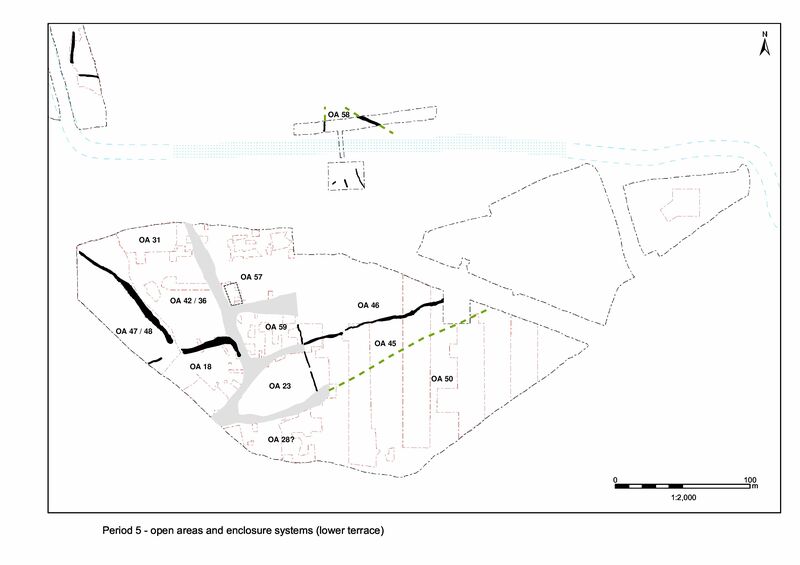 It may be reasonably conjectured that this is perhaps similar to that between temple precinct OA23 and OA45 (though in Period 5 even this long-standing relationship is changing). Much of OA46 is presumed to be kept free of occupation, remaining an open expanse in front of OA59 and alongside OA45 (Figure 181). However, no excavation was carried out across its interior between Excavation Areas H and M to be certain of this. Slightly sinuous ditch 25260/25262/25077/25078 is imposed along the southern limit of OA46 (see 'Roads 1 and 2'), demonstrating a clear distinction between OAs 45 and 46 in this period. Whether or not Period 4 Building 57 survives into Period 5 is uncertain, but is seems safest to assume that it does not. 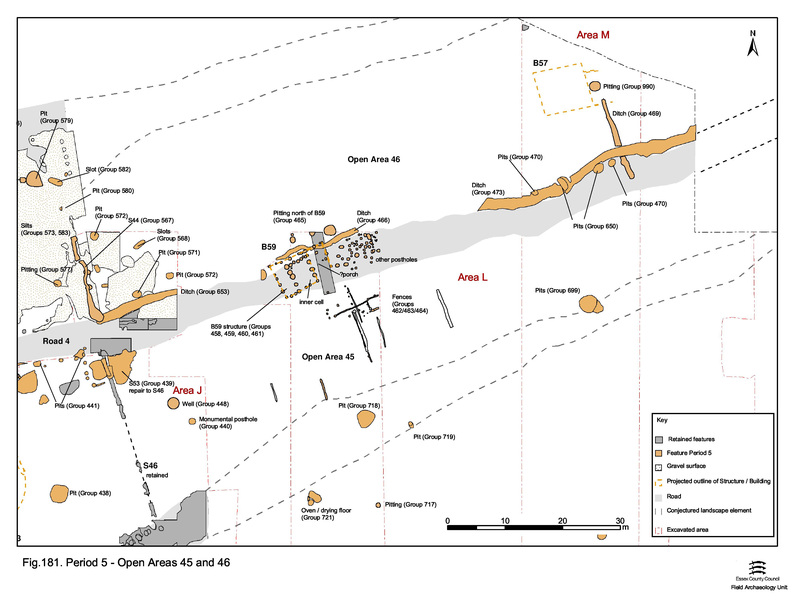 25079 (segs 15010, 15055, 15098, 15145 Group 469) is a roughly parallel, shallow gully/slot running across the eastern part of Open Area 46 (in Excavation Area M). It is a maximum of 1.0m wide with rounded terminals at either end. Its southern end lies at the edge of, or perhaps on, track 4 from which point it extends north for 15m. The gully fills contain 4th century pottery (KPG38, dated c. AD 360/370-400), tile, animal bone and three coins, the latest with a firm date being of Constantine (AD 330-335, SF5909). Late Roman pitting is scattered across OA46 and examples are present wherever excavation was undertaken (i.e. 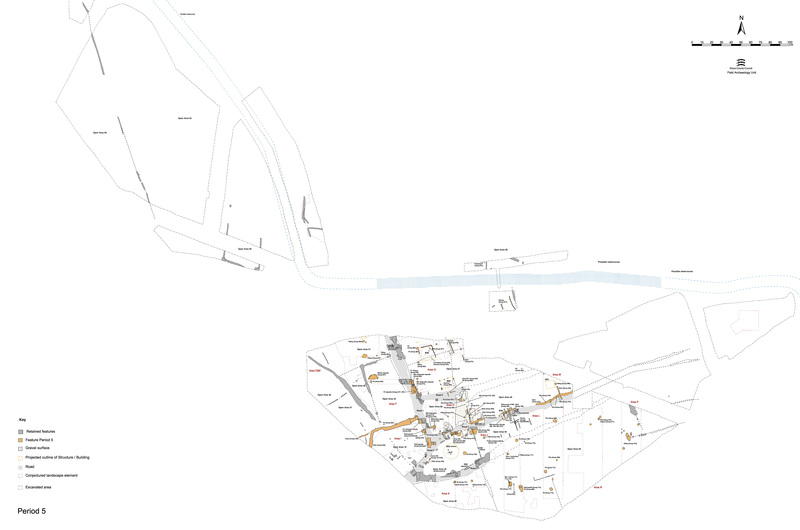 in Excavation Areas H, L and M). Those immediately east of Structure 44 are generally rounded and between 1m and 1.75m in maximum dimension. 16159, 16162 (Group 572), 16214 (Group 571) are all under 0.23m, the rest (16228, 16263 Group 566) all in excess of 0.5m. Although separated by the boundary, these pits do not seem particularly different from those in OA59. Small pit 15206 (Group 990), in Excavation Area M, may be located in relation to the north end of gully 25079. 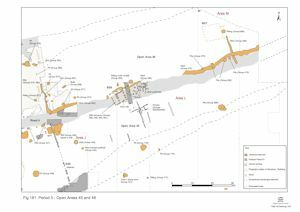 Although technically within OA46, pits 20418 and 20818 (Group 465) are immediately north of Building 59 (in Excavation Area L) and contain assemblages of pottery, tile and tessera very similar to those in its component post-holes (though larger). It is quite possible that these pits are related to the building's occupation, but deliberately placed along the opposite side of the ditch. Finds assemblages from these late pits are moderate in quantity in comparison with those from other areas, but are still typified by an increase in tile, stone rubble and possibly animal bone. They contain nothing to contradict use as domestic rubbish disposal, with no discernible difference between the two depth-groupings. 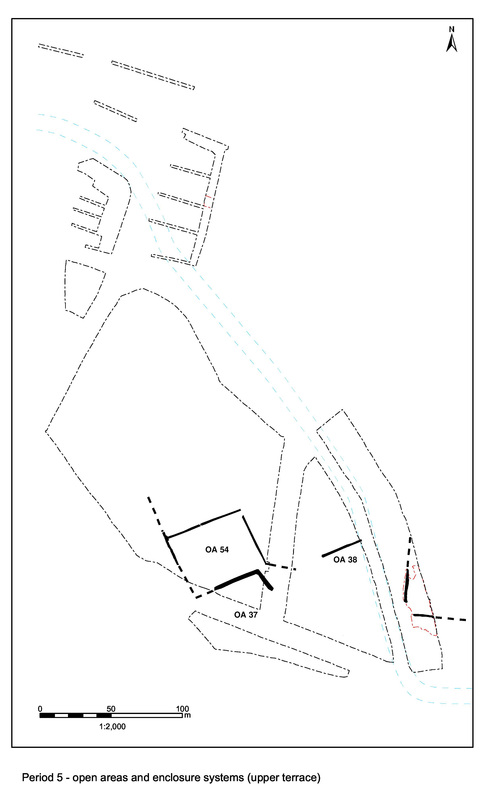 Minor slots are located just east of Structure 44 (in Excavation Area H). These are similar to slots further west in OA59 and, although they may be structural, give no insight into the Late Roman use of this vicinity of OA46.